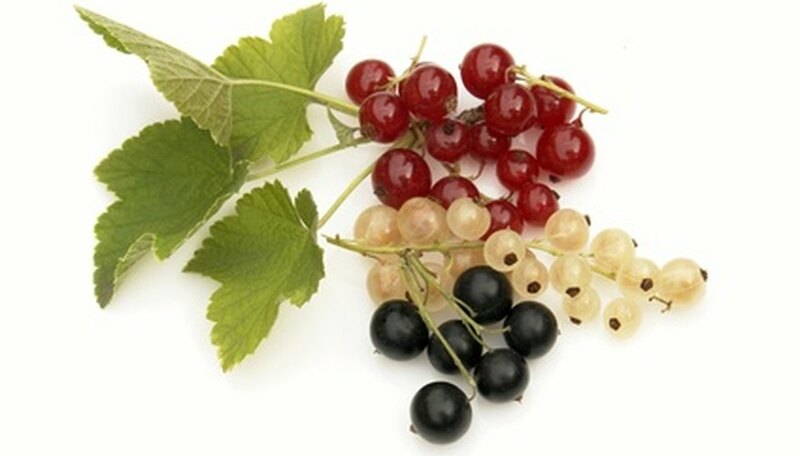 Currants are small fruit from the ribe family and are native to northern Europe and Asia. They come in three varieties: red, white and black. Primarily used for jams and jellies, currants can be made into wine or combined with other fruit and baked into pies or tarts, adding a little zip to low acid fruits. Currant bushes experience few plant diseases; all can be easily identified and treated with fungicide. In wet spring weather, some red and white currant bushes can develop powdery mildew. Plants affected by this fungal disease develop a tiny white coat of mildew spores. This is a mild disease that mainly affects the bush's appearance, but it will spread to currant fruit if not treated. Gardeners can treat currant bushes for powdery mildew with fungicide or horticultural oil; they should check with local county extension officials for a list of approved fungicides for their area before treating. Leaf spot causes red or white currant bush foliage to become dotted with black or brown spots. As the infection worsens, leaves fall off the currant bush. The fungus can live in the soil and in dropped foliage, so gardeners should rake up leaves as they fall. Treat for leaf spot with an approved fungicide. Anthracnose is a fungal disease of red and white currant bushes similar to leaf spot. It causes tan spots with dark purple outlines to appear on foliage. As the infection worsens, leaves can turn yellow. Currant bushes affected with anthracnose become less productive and less vigorous. The infection can spread to the fruit, causing it to crack open. Lime sulfur or copper-based fungicides can be used to prevent anthracnose infections if applied from the beginning of spring through summer, which is the prime period of infection. Black currants formerly carried white pine blister rust. From 1920 to 1966, black currants were banned in North America to protect the white pine population. With the development of disease-resistant cultivars, the ban was lifted, but this type of currant is still rare. White pine blister rust relies on two plants (a white pine and a host tree, such as black currant) to develop, and can kill the host plants. Gardeners may hear about this disease; however, it does not affect red or white currants and should not affect black currents being sold on the market today. Keeping currant bushes pruned regularly helps ward off the fungal diseases anthracnose, leaf spot and powdery mildew. Prune bushes in the spring when frost danger passes. Remove dead, diseased or damaged branches. Then prune off branches that compress other limbs. Clean up the canopy to promote air circulation by removing weak branches too thin to bear fruit, old branches with woody stems, and vertically growing branches.